Are you ready to get a song stuck in your head? No? Oh, ok, well then maybe you'd just rather build a snowman...do you want to build a snowman? Ha! Gotcha. Now that'll be stuck in your head for the rest of the day. Don't be mad at us. Seriously, now, don't be mad at us. In fact, just let it go, ok? LET IT GO. Haha, that's two songs stuck in your head. It could be worse though. We could have rickrolled you just now instead. So what is it about Frozen that everyone loves so much? We hear the songs all over the place, and they get stuck in our heads so easily (sorry about that...), so what is it that makes this particular movie so popular? Well, it could be the themes of independence with with princesses, or it could be the incredibly popular soundtrack. We tend to think it's because of Olaf. That guy's hilarious, and we haven't met a person that doesn't like him. He's simple but kind and lovable, and he won't melt! 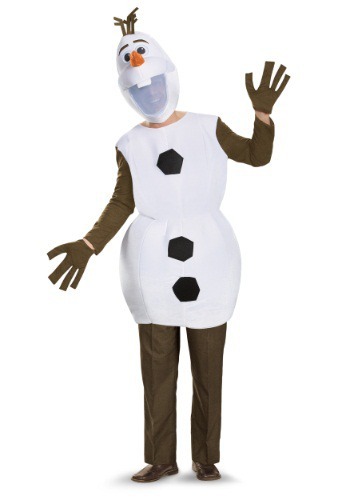 Which is a lot like this Plus Size Adult Olaf costume...lovable, and it won't melt.